What defines the most successful dental practices? They plan, prepare and market effectively. 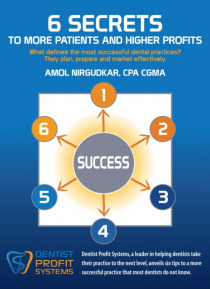 This ebook delivers six secrets to more patients and higher profits that will enable you, as the dentist and business leader, to emulate 6 successful strategies employed by the most successful dentists in America. Learn how to assess your community and practice demographics to find out what new expertise … you need to flourish locally. Learn the importance of developing your personal brand in today's world. Learn tactics for building your reputation and developing profitable niche services. Learn what to evaluate when you competitively set your fees. Learn what modes of marketing are especially effective for dentists as we begin year 2014.